Why Not Add A Double Glazed Porch? Every house, cottage or flat has its own individual style and even though a whole housing estate will have been built with only four or five different designs to the living space they all end up eventually unique. This is everyone’s perception of what their home should look and feel like inside. Some homes have very small entrances, with some having no hallway at all bypassing through the front door straight into either the living room or kitchen directly. A porch can change the whole outlook on your entrance and make the home more welcoming. The wellie room is the popular name for a back porch and ideal when shoes or animals are not allowed straight into your house. It will also keep the weather outside and no blustery days will be the same when only the porch door is open and not your main house door. Double glazed composite doors with the added locking systems will keep both doors secure. A porch which is usually entirely made of glass can be a window of opportunity to a thief, if they chance that once through this obstacle the internal door into the house may not be such a barrier. Having a composite internal door as well provides peace of mind in terms of security. 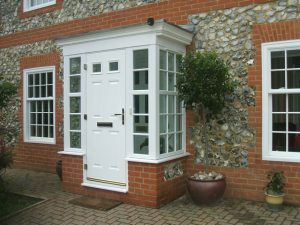 Porches add their own character to your home; they can be individually designed and made to measure. With this in mind a very stylish entrance can be created. A brick based porch can be a more permanent fixture and add stability to the structure. Double glazed glass is the perfect solution to any draught and heat problems. In terms of the windows, if you would like them to open you can have the added extra touch of decorative panels and even in the roof if you opt for glass. This will also let in all the natural light you had even before the porch was added. To finish things off perfectly UPVC drain piping and guttering will take off the excess water and the windows and doors made of maintenance free UPVC will last a lifetime. The added advantage is that they will be easy to wipe down, keep clean and never need painting, so flaking will not be a problem. This will look fantastic for many years to come. Maintaining windows and doors can be an arduous and time consuming process so make sure you choose these windows which need no maintenance.